The inauguration ceremony of the ‘Smart Sri Lanka’ programme organised by the SLFP Youth Front with the aim of providing solutions to the issues faced by Sri Lankan youth will be held under the patronage of President Maithripala Sirisena in Polonnaruwa tomorrow (8), SLFP Youth Front Chairman MP Shantha Bandara said. Speaking to the media yesterday at the SLFP headquarters, MP Bandara said they expect to establish 50 Sri Lanka Tertiary Guidance Institutes (SLTGIs) under this programme islandwide and these centres will be open to all Sri Lankan youth regardless of their political views. 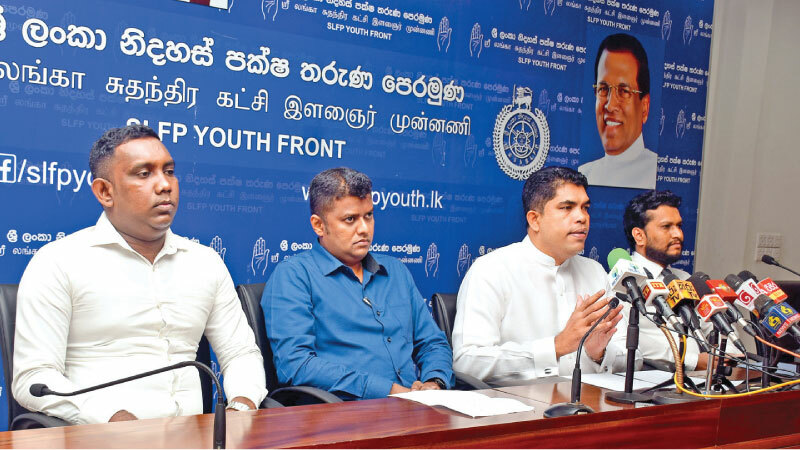 SLFP organiser for Habaraduwa electorate Thisara Gunasinghe said the SLFP Youth Front is committed to providing permanent solutions to the issues faced by Sri Lankan youth in order to prevent future youth unrest. “Unemployment of educated youth is a major factor leading to youth unrest in Sri Lanka and the SLTGIs will provide necessary guidance for youth to solve their issues,” he said. Responding to a question by a journalist, the MP said the only intention of the UNP to form a national government is to increase the number of ministers and not to develop the country or to improve people’s welfare. He said the SLFP is strictly opposed to the proposal to form a national government and will take all possible measures to defeat any such move. Forming a national government with the SLMC is illegal as well as unethical, since the UNF and SLMC MPs, except for one, contested under the same symbol of the ‘elephant’. Only one MP originally contested under the SLMC symbol of the ‘tree’, he said. According to the Constitution, a national government means a government formed by a recognised political party or the independent group which obtains the highest number of Parliament seats together with the other recognised political parties or independent groups, Bandara said.